We were thrilled to be commissioned by Decorex International to create an entrance installation celebrating the 40th year of the show at Syon Park. 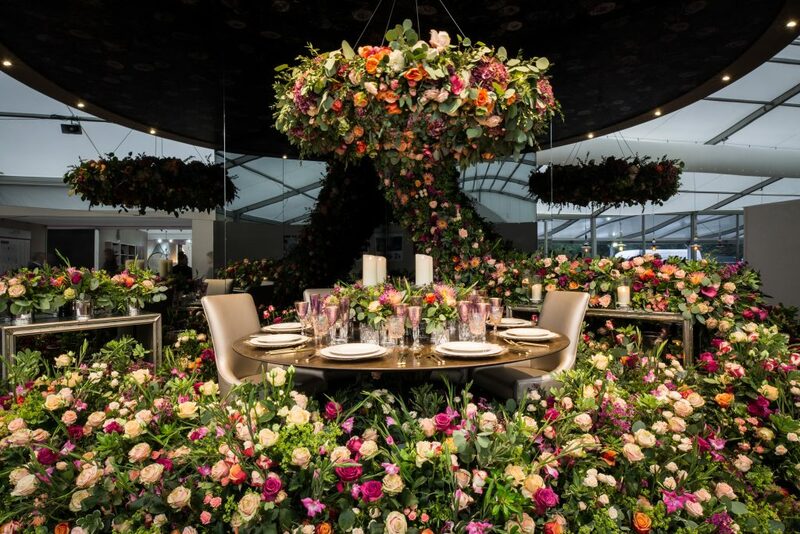 With the concept of disruptive dining, Larry Walshe and three other designers Matthew Williamson, Beata Heuman & Eligo Studio worked to create a series of fabulous spaces on a spectacular revolving carousel positioned at the entrance to the show. Our design, titled “A reflection of beauty” looks at the use of reflection and refraction to alter perceptions and enhance the overall dynamic of the space. We commissioned Dominic Schuster to clad both of our walls with a smoked, mercury mirror that offers a masculine backdrop to a very soft and romantic scheme. We then selected pieces from the Julian Chichester collection which offer clean, simple lines to compliment such a riot of flowers. Dining chairs from Chapel Street London offer further metallic references whilst tableware from Duchess and Butler works to create a detailed and eccentric table scape. 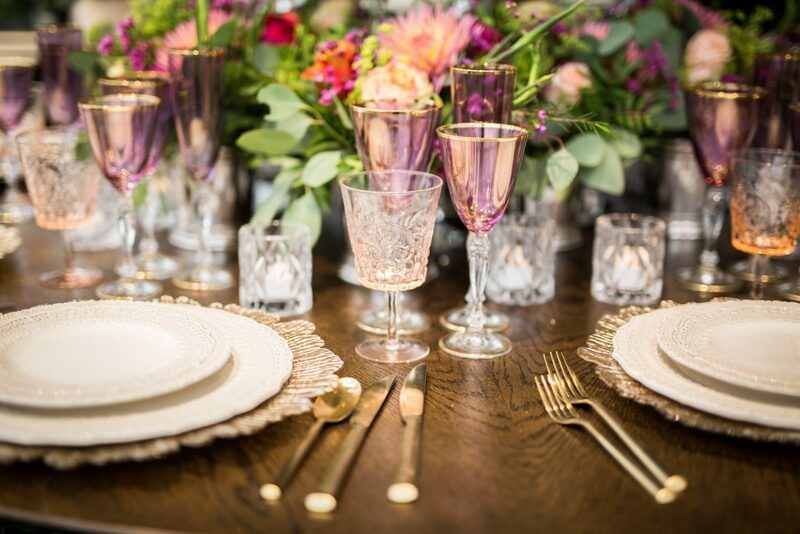 The use of purple glass wine glasses with gold metallic detailing, champagne glass charger plates and blush pink water goblets all combine alongside gold cutlery and vintage lace chinaware to create the most heavenly table setting. Each of the tones selected can be found in the flowers chosen to create a truly immersive and cohesive scheme. Collaborating with expert wallpaper designers Fromental, we created a sensational design to sit on the ceiling of our installation. 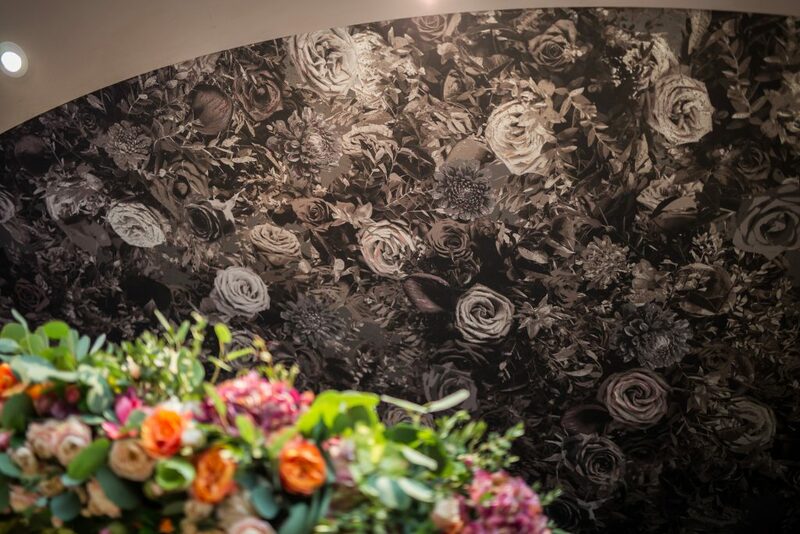 Using the smoked mirror as our base colour, flowers are applied in a bespoke design to appear as though they are reflecting from the floor below. Printed in greyscale to give them impression they have been embossed, each flower is then hand finished with a delicate splash of colour to bring them to life! 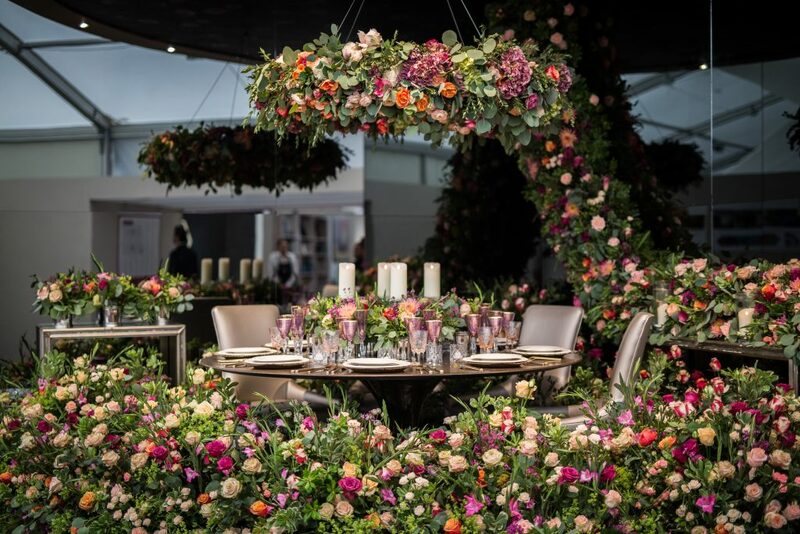 With over 2,000 fresh flower stems the design created by Larry Walshe for Decorex International 2017 features roses, spray roses, gladioli, chamelaucium, British dahlias and alchemilla mollis. This riot of colour combines with fragrant foliages to result in a soft and romantic scheme which juxtaposes the masculine references beautifully and offers a sense of femininity whilst still maintaining a beautifully striking silhouette. 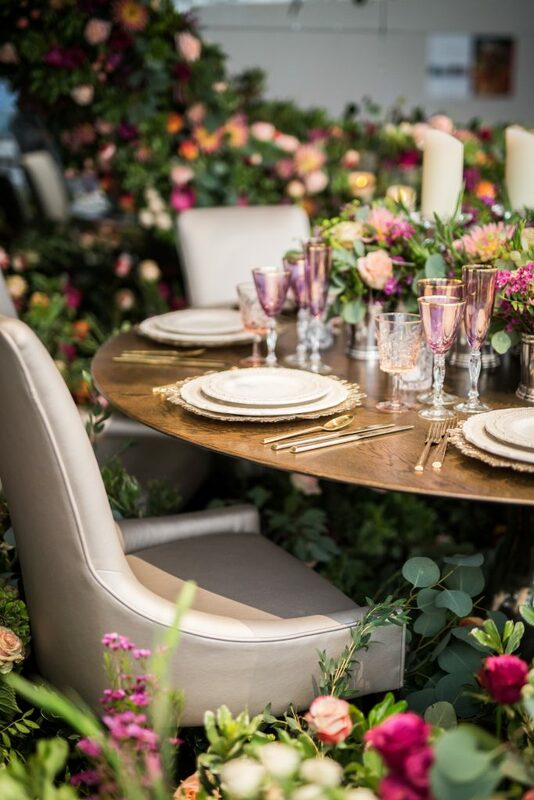 Crystal accessories were then interwoven throughout the floor of flowers, floral cascades, floral chandelier and furniture to add a wonderful sense of occasion.